BE in collaboration with Toolroom Knights will be hosting the legendary Space Ibiza Terrace every Wednesday, showcasing some of the hottest and most prolific artists electronic dance music has to offer. 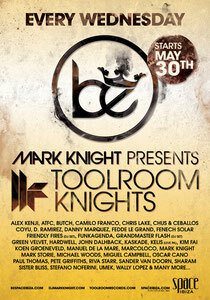 BE presents Toolroom Knights is where you will exclusively see Mark Knight, label boss of Toolroom records, leading the charge across all 19 dates, starting with the grand opening party on May 30th alongside British sensations Friendly Fires as they take to the decks with an exclusive DJ set. This is hotly followed by one of the founding fathers of dance, Grandmaster Flash, who will be wowing the crowd with his turntable skills. Opening the proceedings will be Miguel Campbell, the name on everyone’s lips this year bringing ‘Something Special’ to the launch of the 2012 Ibiza season. Since its launch in 2004, Toolroom Records has become one of the most prominent labels of the electronic scene with continued Global success on all major download stores. 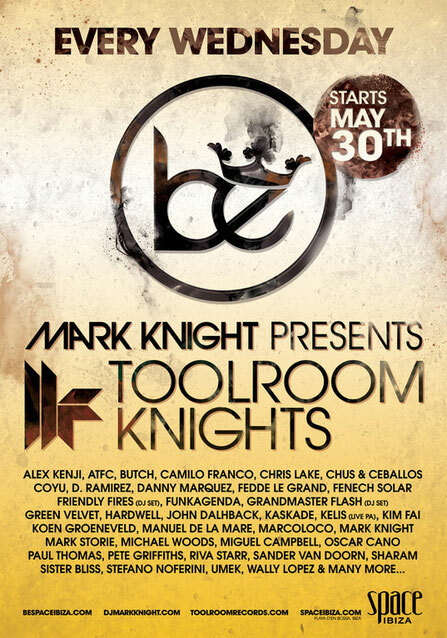 Toolroom Knights’ residency at Space Ibiza is set to eclipse last year’s success, hoping to give dance music aficionados an experience like no other on the magical isle. A host of exclusive guests joining them throughout summer, taking you on a journey synonymous with the musical integrity of the label. Massive names to grace the BE arena this season will include house expert Wally Lopez and tech house hotshot Fedde le Grand - both back after setting BE on fire last season. There will also be debut TK performances from Green Velvet, Riva Starr, Kaskade, Miguel Campbell, Kelis (Live), Sharam and more. The ever-faithful Toolroom stalwarts Umek, Funkagenda, Chris Lake, Stefano Noferini, Michael Woods, John Dahlbac and Mark Storie will also be gracing the stage with many more acts joining Mark Knight across the season. BE residents Marcoloco and Oscar Cano complete the line-up.